Riceverai subito un buono sconto del 10% da utilizzare per il tuo primo acquisto! Oxeego Pixels, the technical cycling sock available in 6 new colors. The new compression sock designed for running and recovery after sport. Fitted and high transpiration sock strengthened in the tip and heel with maximum breathability zones around the arch and instep of the foot. Ideal for running in every situations. Oxeego Running Stripes guarantees maximum performance during your runs in any situation. Socks thought for who practices sports outdoors, which activity needs better heel’s protection, but also ideal for everyday use. 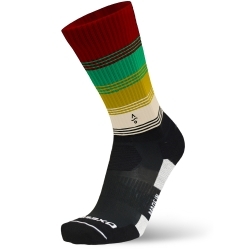 The specific socks for Trail Running, ideal for long run on mixed terrain. 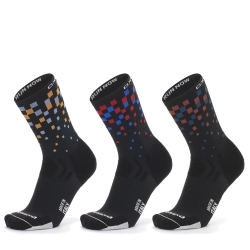 Extra long sock completely black or white specific for cycling, breathable and temperature-regulating. Long sock for winter sports' lovers who need an higher protection of the shin area, which sets on the ski boot.